If your current accounting method is strictly cash and you're not interested in real-time inventories you've selected Accounting Method C (Cash Focus). What Does Method C look like? 1. No integration with production information. If you're tracking field or livestock performance records, they'll be isolated in separate, unconnected databases (or sheets of paper). 2. Pure cash accounting. Your internal accounting records will exactly mirror your cash-basis Schedule F tax return. 3. No inventory tracking. Most likely you're counting inventories once a year when you complete your lender's financial statement. Those inventory values are recorded in a separate form or spreadsheet, not through your accounting system. 4. You only need to see your accountant once or twice a year for tax planning/preparation. You rely on your accountant to review and straighten out your cash records and transfer them to your tax return. What are the benefits of Method C? 1. Fulfills the most critical accounting requirement: tax records. 2. Little training or accounting expertise needed. 3. Will work with a "lowest common denominator" accounting program rather than more expensive and specialized ag accounting software. 4. Because of #3 this makes life easier for your tax accountant. What are the downsides of Method C? 1. Cash accounting intentionally distorts measurement of farm profitability. 2. No unit cost analysis by commodity, crop year, farm, field or group. 3. Little accounting control because no inventory control or reconciliation. 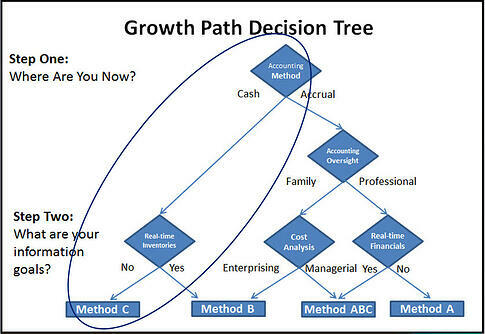 Most farmers "choose" Method C without walking through an elaborate decision tree. It's simply the "path of least resistance." Method C doesn't have to be the end of the road, though. Just follow the Growth Path we'll describe in upcoming articles.